InvacareÂ® presents our new Adjustable Folding Cane. 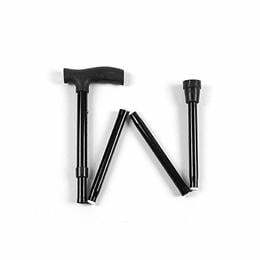 This adjustable cane folds to a compact 10in and can be conveniently tucked away for storage. Its sleek styling includes a comfortable contour grip, black anodized aluminum shaft and non-slip rubber tip. The Adjustable Folding Cane, model 40800, offers a lifetime limited warranty.